Totally 117 images taken with two cameras were used for creation of this breathtaking wide-angle image of solar corona. The 24th solar activity cycle was probably very near to its peak during 2013 eclipse therefore a lot of interesting features including two CMEs are visible in the solar corona. The full resolution version of this image you may download here. Click on the image or on the following reference to display the higher resolution image version (1.3 MB, PNG format). 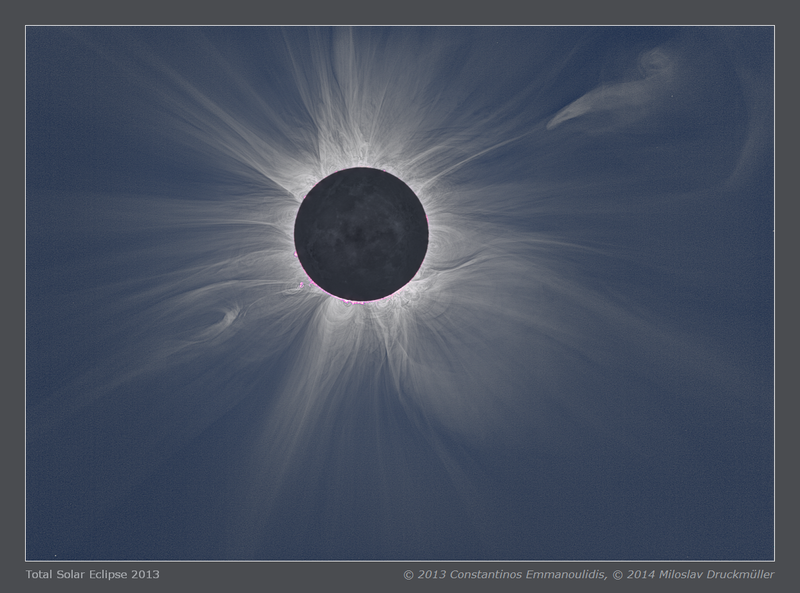 Processing Composition of totally 117 eclipse images, (1) 66 images, (2) 51 images. Eclipse images were calibrated by means of large number of dark frames and flat-fields, aligned by means of phase correlation, composed by means of LDIC 5.0 software, processed using Corona 4.1 in order to visualize coronal structures. Final processing was done using ACC 6.1 software.